The South Place Hotel and the stylish Chop House restaurant attached to it are located in the heart of the City in Moorgate at 3 South Place, a few minutes walk from Liverpool Street station. On this occasion my partner and I are joined once again by one of London’s most feared and respected critics, my thirteen year old son Jacob, who fancies himself as “the final word” when it comes to the consumption of fine meats. So it is with some trepidation that we enter this vibrant restaurant to enjoy what we hope will be the first rate fare on offer here. 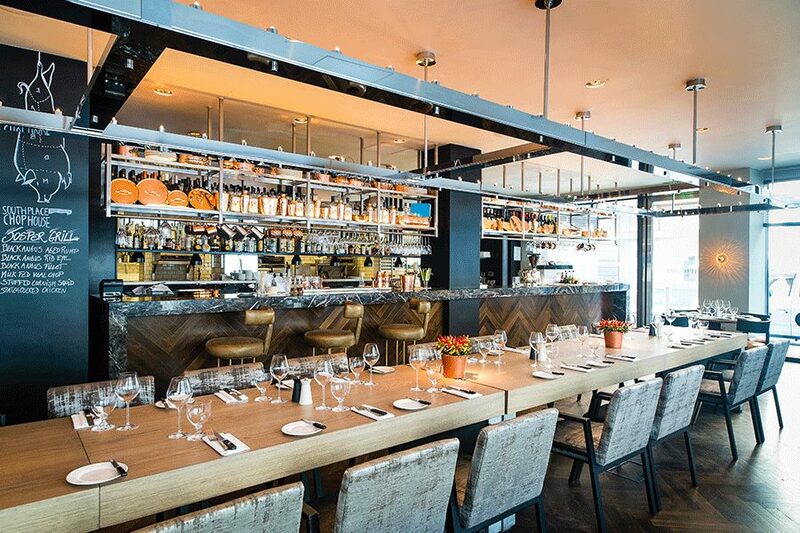 The Chop House is glass-fronted from floor to ceiling giving visitors a view of the city surroundings. The seating really is very comfortable and customers have a choice between a large banquet table or small padded armchairs and sofas set around the relatively smaller tables. The lighting is a sleek, chromed, straight-lined, drop down/suspended modern affair with the accompanying bar very much in keeping with this. There is artwork by Thørbjorn Andersen and huge copper vats (which look to be pieces of distillery equipment) to lend interest to the eye, and very pleasing the overall effect is too. Should you visit the loos here, on your way to them you will also discover a clever piece of installation art in the form of an ever-changing strobe-like film on a screen which morphs and switches up in time to the piped music in this section of the building. It certainly catches my eye enough for me to stand and watch the screen for a while. This place has a great vibe to it, and as a result can get busy. On the Sunday we visit, the large banquet table is taken up by a group of twenty something girls out for one of their birthdays or a very stylish hen do. Unfortunately, due to this large booking, by the time we arrive the pork belly on the menu that immediately cries out to us to be snatched up and eaten had clearly caught a few too many of the aforementioned ladies’ eyes too; there was none left. Such a pity as it looks amazing, but worth noting to arrive a little earlier next time. We start our Sunday roast meal at the Chop House with the fish cake and salad with bacon bits, blue cheese dressing and extra prawns. Both our starters are fine, and thoroughly enjoyable, although my partner is a little disappointed that the prawns that arrive with his salad are not king prawns (to be fair they are not advertised as so, but given the supplementary charge incurred one might presume they should be). For mains, my partner and I both have the beef roast, and our intimidating critic Jacob, Chop House’s finest burger. Now I am happy to report that the meat here is fantastic. The beef is thickly cut and succulently medium rare, Jacob’s burger according to him, one of the best burgers he’s ever tasted (and trust me ladies and gentlemen this is no small feat!). The accompanying cauliflower cheese is just perfect, as is the choice of Felino Malbec too. There is a small “but” though: the roast potatoes are typically small in number; there are only two of them. What is it with these modern small portions of our earth-dwelling friends that so many restaurants now serve?! For pudding, we plump for the waffles with chocolate sauce and the sticky toffee pudding, which we customarily share, purely in the interests of professionalism of course, and never anything to do with food envy. This is a restaurant that we would recommend should you find yourselves in the City on a Sunday. 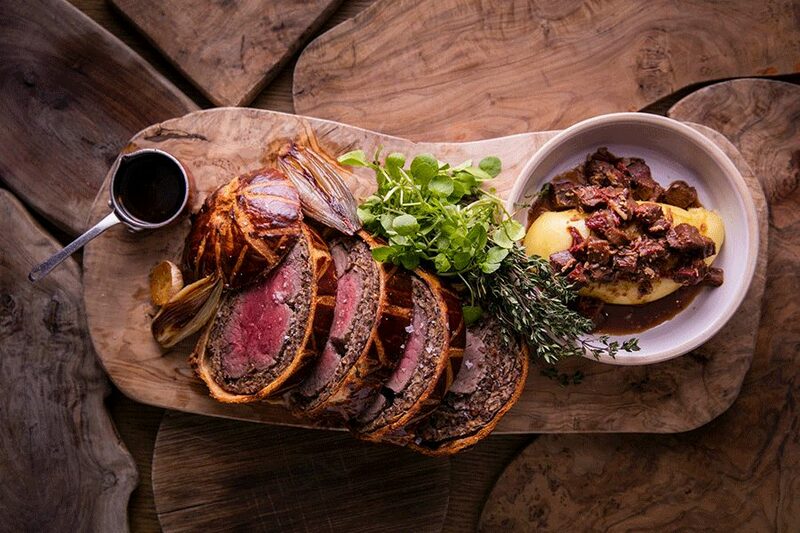 It’s a great vibey spot, and you really could do so much worse, especially if you enjoy a good drop of wine with your Sunday roast, as there is the bottomless option at a reasonable £18 extra per head that’s well worth a look.